TOL Business Travel Sweepstakes: Win a Trip from TOL! 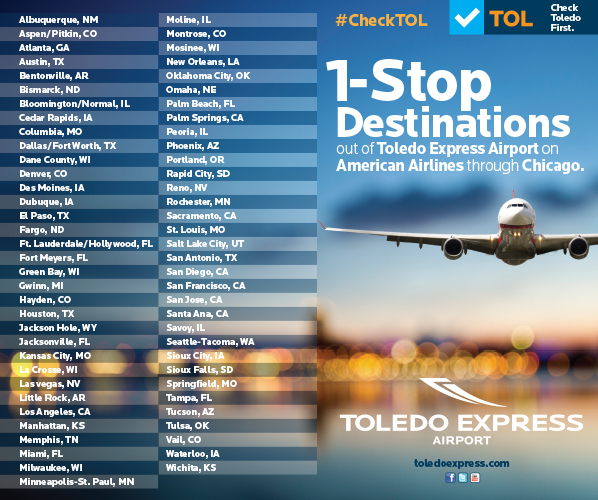 The Toledo Express Airport is giving you a chance to win two roundtrip tickets from TOL to anywhere American Airlines flies within the Continental United States. Where will you go? You have plenty of options with nearly 80 one-stop destinations through Chicago O’Hare International Airport. Please click here to view contest rules and regulations.